Liverpool may have been handed a boost in their pursuit of PSV forward Memphis Depay as the youngster denies holding talks over a move to Manchester United. Read more Manchester United transfer gossip with our FREE Football app! The 21-year-old has been in exceptional form for the Eredivisie champions this term, looking like one of the best young players in Europe on current form and one who could succeed in a more competitive league. 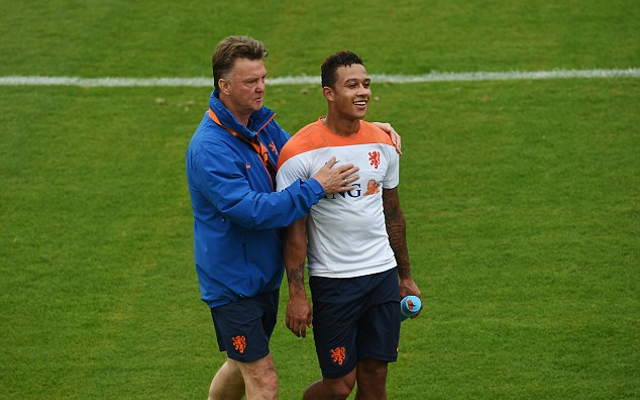 Top clubs seem to be queueing up to sign Depay this summer, but the player himself has insisted he does not know where his future lies, denying that he is already in talks over a transfer to Old Trafford. According to the Daily Mirror, Red Devils manager Louis van Gaal has also declined to comment on speculation linking his club with the Netherlands international, who played under him to great success during his time in charge of the Dutch national team, including at last summer’s World Cup finals in Brazil.